View our updated Press Releases here. The vivacious 3 Tons of Fun lovelies had their audience eating out of the palms of their hands when they performed at The Caledon Casino, Hotel, Spa & Entertainment recently. The Swartberg Venue was packed to the rafters for the show which featured resonating renditions of timeless songs from the disco era, traditional African music and pop. Although regular performers at the Swartberg, the voluptuous trio never do the same show twice, performing new songs each time and always interacting with their audience. 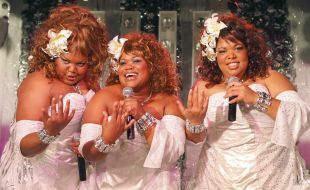 3 Tons of Fun, starringMichelle Thomas, Bulelwa Sakayi and Sthe Mfuphi, is one of Cape Town's and South Africa's most loved all female groups. Their high-energy, fun-filled cabaret show attracts full houses wherever it goes. Emo Adams and the talented Take Note Band are back in the Overberg for a winter warm-up concert at The Caledon Casino, Hotel, Spa & Entertainment on the 7th of June 2014. Buoyed by the response to their show in 2013, The Caledon Casino, Hotel, Spa & Entertainment are anticipating a sell-out event. Tickets cost R140 per person and are available online via Computicket; the Caledon Casino’s Cash Desk or the Hotel’s Reception. The show will be hosted at The Caledon Casino, Hotel’s Swartberg venue and will kick off at 20:00 while doors will open earlier at 19:30. “We are delighted to welcome Emo Adams and the Take Note Band back to our stage this June. It promises to be a stunning show featuring a mix of Adams’ original songs and a few covers of timeless hits from different music genres. So, there will be something to suit every music taste,” says Paul Campbell, Director of Operations and Complex General Manager of The Caledon Casino, Hotel, Spa and Entertainment. With over 15 years in the entertainment industry and his finger on the pulse of local music, he promises an evening of superlative entertainment that will appeal to both young and old. 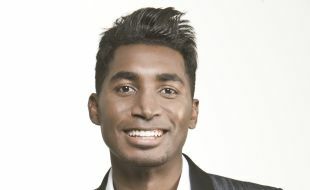 Emo Adams is best-known for his collaborations with David Kramer and the late Taliep Petersen, and specifically, his roles in “District 6: The Musical” and “Kat and the Kings”. These days, his talk show, “Jou Show Met Emo”, is one of the most popular shows on KykNet and it is currently in its third season. Since stepping into the Afrikaans music scene, Adams has earned favour with audiences across the country, never failing to entertain with his energetic and goofyperformances. His diverse singing talent and his comical and dynamic stage personality is a unique package. For more information please visit www.thecaledon.co.za or call 028 214 5100. The Stormers had the enthusiastic support of a group of young rugby fans from Kleinmond Primary when they took on the Lions at Newlands on the 19th of April. 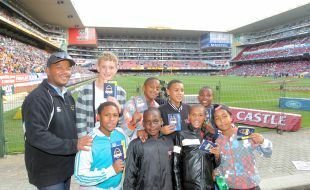 The youngsters’ exciting day in the stands was sponsored by The Caledon in collaboration with Club Newlands. For some of them it was their first time at a live rugby match. They waved flags, cheered and clapped as they watched their rugby heroes in action. The Caledon and Club Newlands work in partnership to bring the game of rugby closer to home for young rugby enthusiasts. In addition to hosting learners from local schools at rugby games, the partners also host a series of Coaching Clinics for Overberg schools during the year. At the Coaching Clinics, young rugby players get to meet some of their Stormers Rugby heroes and are put through their paces by professional coaches. The partnership with Club Newlands forms part of the Tsogo Sun group’s Suncares initiative. Tsogo Sun, The Caledon’s holding company, is the official accommodation supplier to WP Rugby. Some 130 school learners from Overberg Schools recently participated in a Chess Tournament sponsored by The Caledon Casino, Hotel & Spa and arranged in partnership with Overberg Chess as part of Tsogo Sun’s SunCares initiative, Moves for Life. Moves for Life uses the sport of chess as a catalyst for education in the crucial areas of maths, science and literacy. 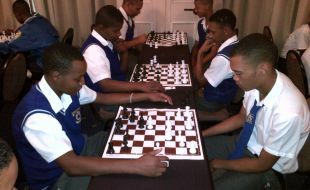 Over the next three years, Tsogo Sun will invest more than R10 million in the national school chess programme. Nationally, more than 400 teachers have been trained as facilitators in the programme and by the end of the year about 15 000 children will be on their way to grasping the wonders of chess. The Overberg schools that are part of the Tsogo Sun Moves for Life MiniChess Programme include Grabouw High; Groenberg Secondary, Vyeboom Primary, de Villiersgraaf High; Overberg High; Swartberg Primary and Secondary; Bredasdorp High and Primary; Curro Private School; Swellendam High and Primary; Northcliff High, Kleinmond Primary; Gansbaai Primary; Hermanus High and Primary; de Bron Primary and Hawston Primary. Overberg Chess, which is the official partner to the programme locally, will help coordinate the initiative. There will be a series of tournaments held during the course of the year, in addition to “coaching the coaches” sessions, the first of which happened in March. Tsogo Sun’s Group CSI Manager, Shanda Paine says; “Chess is listed among the government’s top 16 priority sporting codes for inclusion at school level and the educational development through chess then aligns strongly with sport and education. Learners from various Overberg schools recently participated in a Chess Tournament hosted at The Caledon Casino, Hotel & Spa as part of Tsogo Sun’s SunCares Moves For Life MiniChess Programme. This was the first in a series of tournaments and “coaching the coaches” sessions that will be hosted in collaboration with Overberg Chess in the coming months. 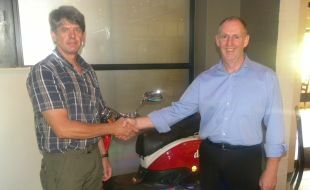 Craig Harris is the proud new owner of a nifty Big Boy Scooter which he won in a competition at The Caledon Casino, Hotel, Spa & Entertainment’s DaVinci Restaurant. The promotion ran from January to the end of March. Customers spending R50 or more at the restaurant received a stamp on their promotion cards. Completed cards, bearing 10 stamps, were entered into a lucky draw which took place on 1 April. Craig, whose card was randomly drawn from the tombola, is pictured here (left) with Paul Campbell, the Director of Operations and Complex General Manager at The Caledon Casino, Hotel, Spa & Entertainment. Comedy legend, Barry Hilton, had his fans in fits of laughter with his elastic-like facial expressions and hysterical on-stage antics when he performed his latest one-man production, “The Way I See It” to a capacity crowd at Caledon Casino, Hotel, Spa and Entertainment on Saturday the 29th of March. With more comedians on the South African comedy scene than ever before, Hilton still tops the list with theatres, corporates and advertising agencies. He has stayed on the scene by keeping it clean and continually coming up with new material and once again delivered a hilarious performance, which definitely bode well with his fans in Caledon over the weekend. After his show, he took the time to meet and greet his fans, and sign autographs. From left to right; Mr & Mrs Myklebust; Mr & Mrs Stanissis; Robert Hicks; Barry Hilton and Ailsa Van Wyk, Marketing Manager at Caledon Casino, Hotel, Spa and Entertainment. For information on upcoming shows please visit www.thecaledon.co.za or call 028 214 5100. The inimitable 3 Tons of Fun all-girls cabaret group are back at The Caledon Casino, Hotel, Spa & Entertainment for another one of their spellbinding shows on Sat, 3rd May 2014. The vivacious and voluptuous trio will be performing flawless, resonating renditions of timeless songs from the disco era, traditional African music and pop. Regular performers at the resort’s Swartberg Venue, these dazzling songstresses never fail to impress with their captivating stage presence, energetic dancing and spectacular voices. Their shows are never the same, with new songs and always unique interactions with their audience. “Everybody must see these awesome divas at least once. Every song and dance is a show-stopper. You simply cannot help dancing and singing along with them. Having them back at The Caledon is a real treat for everyone, including those who have seen them before,” says Paul Campbell, Director of Operations and Complex General Manager of The CaledonCasino, Hotel, Spa and Entertainment. 3 Tons of Fun, starring Michelle Thomas, Bulelwa Sakayi andSthe Mfuphi, has emerged over the last eight years as one of Cape Town's and South Africa's most loved all female groups. Their high-energy, fun-filled cabaret show attracts full houses wherever it goes. They have performed in countries including Thailand, Switzerland, Swaziland, Togo, Zambia, Ghana, Namibia, Botswana and Nigeria. Tickets to the show at The Caledon Casino, Hotel, Spa & Entertainment cost R100per person. The event takes place in The Caledon Hotel’s Swartberg Venue. Places are limited so pre-booking is essential. Tickets are available online via Computicket; TheCaledon Casino’s Cash Desk or the Hotel’s Reception. Staff & Guests from The Caledon Casino, Hotel, Spa & Entertainment recently participated in the Annual Club Newlands Golf Day at De Zalze Golf Estate in Stellenbosch. 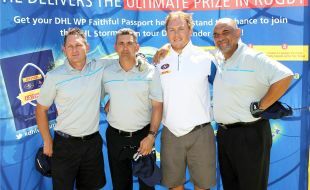 DHL Stormers player, Pat Cilliers, played in one of the four balls entered by the casino. The golf day attracted a full field of golfers. Pictured here, from left are: Marius Krause; Wesley Liversage; the casino’s Gaming Manager, Pat Cilliers and Robert Isaacs. The Caledon Casino, Hotel, Spa & Entertainment works in partnership with Club Newlands to develop young rugby players from Overberg schools and provide learners with opportunities to experience live match days at Newlands. Tsogo Sun, The Caledon Casino Hotel Spa & Entertainment is the official accommodation sponsor of WP Rugby. These young rugby enthusiasts from Swartberg Primary and Overberg Primary in Caledon recently got to camp-out on the fields at Newlands as part of a fun initiative organised by The Caledon Casino, Hotel, Spa, and Entertainment and Club Newlands. The youngsters pitched tents and participated in exciting activities, including some rugby training, before settling in for the night. The partnership between The Caledon and Club Newlands forms part of the Tsogo Sun group’s Suncares initiative. Tsogo Sun, The Caledon Casino’s holding company, is the official accommodation supplier to WP Rugby. 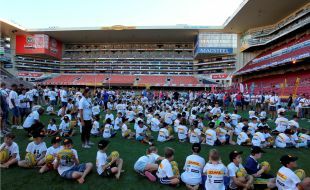 The partners regularly host young learners from Western Cape schools on match days at Newlands to give the youngsters an opportunity to experience the action and thrill of live rugby. Many of the youngsters who attend the Match Day Experiences have never seen a live rugby game close up from the stands. In addition to hosting learners from local schools at rugby games, the partners also host a series of Coaching Clinics for Overberg schools during the year. At the Coaching Clinics, young rugby players get to meet some of their Stormers Rugby heroes and are put through their paces by professional coaches. Under watchful eyes. The youngsters attending the Newlands Sleepover were under the watchful eye of teachers from the Swartbergand Overberg Primary Schools, representatives of the casino and Club Newlands, and parents. Pictured at the event is from left to right Wian Hoffman, Jannie Fourie, Brenwin Swart, Deveigon Hendricks, Rudi Coetzee (the casino’s Gaming Compliance Operations Manager), Vicky Meyer and Brendall Swart. 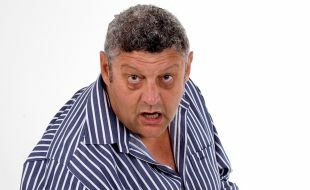 Comedy stalwart, Barry Hilton, is the next in a long line-up of top South African funny men to perform at The Caledon Casino, Hotel, Spa and Entertainment in 2014. He hits the stage at the Swartberg on the 29th of March with his latest one-man show “The Way I See It”. Buoyed by the response to his hilarious “B.E.E” show in 2013, The Caledon expects a capacity crowd for this event. “The Way I See It” offers a hysterically-funny peek into the goings-on inside the comedy legend’s mind. If his elastic-like facial expressions and on-stage antics aren’t enough to have comedy fans in a pleat, his ludicrous outlook on life and humorous take on everyday situations will surely do it. Whether you’re a teenager or a pensioner, a single dad or an internet dating forty year old divorcee, you’ll laugh till your belly aches listening to his side-splitting interpretations of everyday events. With his relaxed stage demeanour and gregarious personality, Hilton continues to strive and thrive. Steering clear of political satire, swearing, explicit content and blasphemy, the comedy stalwart’s fan base continues to grow and his unique international appeal has ensured a fan base that spans the globe. “Barry Hilton has a glorious knack of finding the funny side of everyday occurrences. Regardless of the stresses and strains you might be feeling, he will help you see the lighter side of life. This show is not to be missed by Hilton’s fans, and in fact anyone who needs a jolly good laugh,” says Paul Campbell, Director of Operations and Complex General Manager of The Caledon Casino, Hotel, Spa and Entertainment. Tickets to the show cost R120 per person and are available online via Computicket; The Caledon Casino’s Cash Desk or The Hotel’s Reception. Doors will open at 19:30 and the show starts 20:00.For more information please visit www.thecaledon.co.za or call 028 214 5100. The Caledon and Club Newlands kicked-off the 2014 rugby season at Eaglevlei Wine Estate on 10 February. The kick-off party was attended by representatives of The Caledon, which is a proud sponsor of WP Rugby, representatives from Club Newlands, and the players and coaches. Tsogo Sun, The Caledon’s holding company, is the official hotel and casino partner to WP Rugby and the DHL WP representative teams until 2016. The Caledon Casino, Hotel, Spa and Entertainment itself enjoys a close partnership with WP Rugby and Club Newlands, which has seen the partners host coaching clinics for emerging school rugby players on a regular basis for the past four years. The coaching clinics, part of Tsogo Sun’s Suncares initiative, give young rugby players a chance to interact with professional coaches andexperience the grueling training regimens that career rugby players undergo. The clinics also provide a platform for coaches and club representatives toscout for future rugby stars. “We have a fantastic relationship with WP Rugby and Club Newlands on various initiatives and we look forward to year another fulfilling year of supporting the development of rugby in our local community, ” says Paul Campbell, the Director of Operations and Complex General Manager: The Caledon. 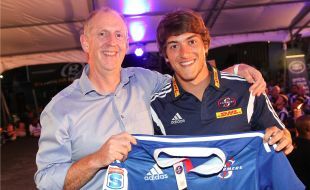 According to him, The Caledon, with Club Newlands, will be continuing to host coaching clinics for local schoolchildren in 2014. 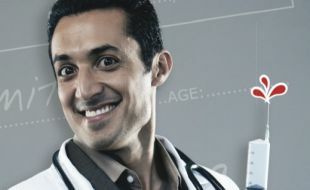 If you’re still suffering from a festive season hangover, don’t miss funny-man Riaad Moosa’s hit comedy show Doctor’s Orders. Loads of laughter is just the antidote for the back to the grindstone blues. He’s on stage at The Caledon Casino, Hotel, Spa and Entertainment on Saturday the 22nd of February for one night only. Award-winning Moosa, one of the most prolific comedians of his generation, also happens to be a qualified doctor. With his own unique style and the remedy for the country’s irks – a healthy dose of laughter – he is widely-known as the ‘comedy doctor’. Moosa has been on tour delivering his Doctor’s Orders since 2012 and is still packing out venues nationwide, from Polokwane and Johannesburg, to Pietermaritzburg, Grahamstown, Nelspruit and Pretoria. Buoyed by rave reviews, venues are queuing-up to bring him to their stage. Now it’s The Caledon’s turn. Riaad Moosa has been on the local comedy circuit for a number of years. He has featured in various shows including Alex Jay’s 5fm comedy Jam and he also wrote and performed in the “Pure Monate Show”, which was aired on SABC 1 and ranked the most popular show amongst the urban youth. A regular headliner on the comedy circuit all overSouth Africa, Moosa has performed with some of South Africa’s comedy greats, and is famous for his own one-man shows such as “Strictly Halaal”. “We are thrilled to be bringing Riaad to our stage. We hope that fans will take the opportunity to join us for some comedy relief with one of the country’s most popular and acclaimed comedians,” says Paul Campbell, Director of Operations and Complex General Manager of The Caledon Casino, Hotel, Spa & Entertainment. The show will be from 8pm at The Caledon Casino’s Swartberg venue. Tickets cost R120 per person and are available at The Caledon Hotel’s Reception, Casino Cash Desk or via Computicket. Pre-booking is advised as places are limited. Fans of the popular SABC soapie, 7de Laan, got the chance to meet two of the cast members, Donnalee Roberts and Ivan Botha, during a special meet and greet session at The Caledon Casino, Hotel, Spa and Entertainment on Friday the 3rd of January. They were in town as part of a road trip for the Help-Net Fund, a non-profit organization which provides safe houses for abused children. During their visit, the pair shared some insights into their new locally-produced Afrikaans movie, Pad na jou Hart. A throng of fans showed up for the meet and greet session. The actors signed autographs and had pictures taken with some of the locals. 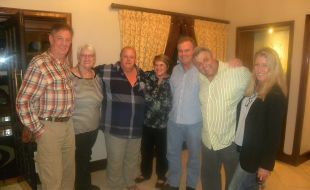 Visitors were also treated to a show by talented singer, Marius Carstens. Ivan Botha and Donnalee Roberts are pictured here with two of the young fans who attended the meet and greet session. Stand a chance to win you’re share of R1.7 million in Tsogo Sun’s first-ever nationwide Roulette Masters Tournament which kicks off on the 13th of January 2014. With R1-million guaranteed to the ultimate winner, the stakes are high. 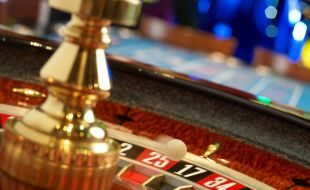 Local Roulette enthusiasts can put themselves in the running by participating in the qualifying rounds at The Caledon Casino, Hotel, Spa and Entertainment between the 13 January and 14 March 2014. Qualifying heats will take place on Monday - Friday and Saturday – Sunday between 5 – 10 pm and 2 – 10 pm. These will take place in the non-smoking casino and buy-in is R100 and there is no limit to the number of qualifyingheats participants enter. Cardholders have an option of also redeeming their points for buy-ins. The Caledon Casino, Hotel, Spa and Entertainment will host its semi-final and final events on 15 March 2014 to determine who goes through to the national finals on 29 March at Gold Reef City Casino, where a share of over R1.7 million in prize money with a guaranteedfirst prize of R1 million. Every weekend for nine weeks, roulette heats will be held at 13 Tsogo Sun casinos, with between one to five players constituting a heat.After buying in, each player receives chips and must play every spin. Players will be given three spins of 90 seconds each and at the end of three spins, the chips remaining will be totalled and scores will be entered onto the leaderboard. Players can enter as often as they like, especially if they don’t make the leader board or feel their present score is too close to the qualification cut off level. Once all the finals have been held in the respective casinos, 36 grand finalists from the various casinos will draw table and playing positions at Gold Reef City Casino. A semi-final round will determine the seven top earning players who will play off in the finals, which constitutes seven spins. The overall winner is the player with the highest total value in chips at the end of the seven spins. 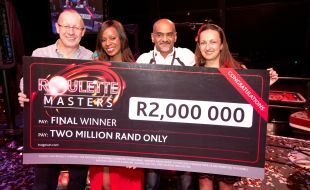 “We are thrilled to announce Tsogo Sun’s first national Roulette Masters Tournament and to give local Roulette players a chance to be part of it. With over R1.7 million in prize money to be won, it is certainly the biggest Roulette tournament to ever be hosted on a national scale and we wish everyone luck,” says ,” Paul Campbell, Director of Operations and Complex General Manager of The Caledon Casino, Hotel, Spa & Entertainment. 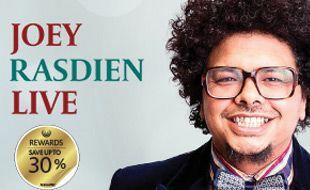 Comedian, Joey Rasdien, hit the funny spot with comedy fans when he performed his off-the-wall “Mixed DNA” show atThe Caledon Casino, Hotel, Spa and Entertainment on 25 January 2014. As expected, he draw a capacity crowd to the Swartberg for his 90-minute show. With his characteristic style of understating the social, political, moral and ethical questions facing everyone today, he had his audience in fits of laughter throughout. Rated one of South Africa’s comedic heavyweights, Joey is also a seasoned television actor and also a star of several local films. Joey’s latest role is as the star of the upcoming action comedy Blitzpatrolie. 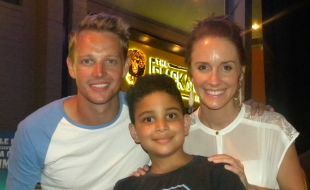 He is pictured here (Centre) with two local fans during the special meet and greet session hosted after the show. Guests lined-up to chat to Joey and get his autograph. For more information please visitwww.thecaledon.co.za or call 028 214 5100.